Four panels of ivory silk satin. Each panel embroidered in Guangdong style with flowers and antique vessels, worked in satin stitch using a restrained style and with graded tints of painted colours for decoration of the landscape painting, marble effects interiors of bronze vessels and other elegant details. Three of the panels are identical to examples in the National Palace Museum, Taiwan, where a group of eight panels with the collector's seals of Zhu Qiqian are mounted as scrolls. They were formerly in the Palace Collection, Beijing. 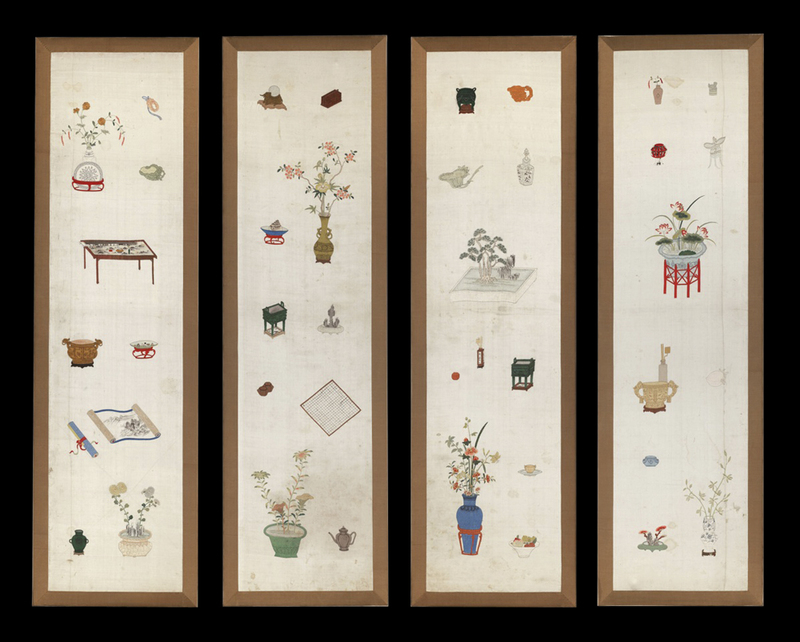 Compare: Embroidery in the Collection of the National Palace Museum, nos. 35-40 illustrated in black and white; nos. 26-27 in colour.